First off, Happy Father’s Day and much gratitude to my Dad for the support he has given me and my pottery life. Thanks Dad, you’re the best. It’s been awhile since I’ve made any pots and I am missing the heat and glow of the kiln, the processes leading up to a firing, and the sound of glaze dripping off a pot. The mystery of the fire with all it’s magic and power supports the alchemy of transforming clay into ceramic and glaze into glass. The wet clay in my hands as it spins on the kick wheel is one of the most calming and centering feelings ever. The clay is not the only one being transformed. I’d like throwing pots to be even more of a daily practice to recharge my batteries and bring me to center. I’m a much nicer person to be around when I make pots. I have more patience when I make pots. I am more present and a better listener when I make pots. I feel so much more connected to myself and others when I spend time making pots. I love the process. For me, the love is in the doing, the making, the glazing, the firing, etc. much more so than the results at the end of a firing. I love seeing the results too, but by then I am already making the next load full of pots. I usually make about 80-100 pots at a time because that is about a full bisque kiln worth depending on the size and shape. As it turns out after glazing, this same number usually fills my favorite gas kiln for the cone 10 glaze firing. Glazing more than this number of pots becomes a chore unless the design is simple and repeated. Space in a small shop is limited and with new pots being made all the time, about 100 to 150 pots waiting for the kiln is about all I can handle. The finished pots are cleaned up and displayed on shelves for me to study and learn from and the rest are kept in boxes ready to sell. I’m about due to build another display shelf so I can unpack a couple more boxes. It’s father’s day today and I’m going to be throwing some pots outside in the warm northern California sun. I’ll post some pics next time. I’ll be participating in my first show this year and I am so excited to finally be putting my pots out there for people to see. 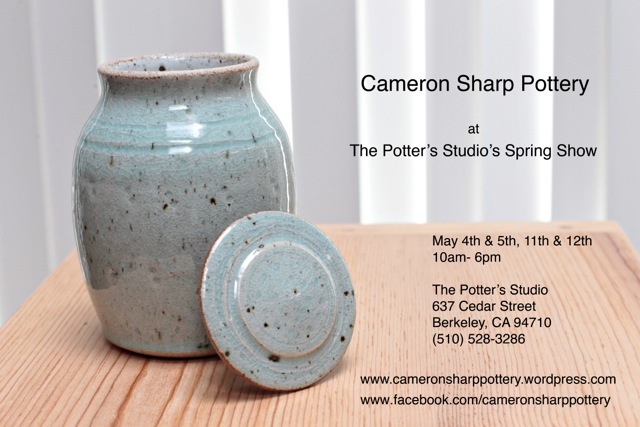 It’s the annual Spring Show at the Potter’s Studio in Berkeley, CA. I’ll have some of my recent work on display and for sale. If you are in the area during the first two weekends in May, please stop by to see me and hold one of my pots in your hands. You can also see the studio where I work and make my pots. As a humble potter my aim is to make functional pots for everyday use and the making of each pot is completed when it’s put to good use. I hope to combine function and beauty in an interesting way that enhances the experience of eating, drinking, cooking, and sharing meals with family and friends. All the info is on the beautiful postcard Ajira created to support me and my pottery. Please feel free to share or post this to your facebook, etc. I hope to see you there. I got a commission to make two custom bowls the other day from a guy named Jameson. Thanks so much for the custom order. I appreciate the support and send peace and gratitude to you on the highest level. It’s amazing how things work out. I was selling some stuff on craigslist and he answered the ad, came over and bought more than what was in the ad. We got to talking about this and that and I told him I was a potter, he told me he was an artist and wanted to see my pots. I showed him some in the kitchen we were using and he said he wanted me to make him two big bowls like the one we use for fruit on our table. We talked about the design and he wants letters on the side saying “OAKLAND, CA” and “GALLUP, NM” to honor the places he has lived. We really connected in what we were sharing with each other and I wish him all the best. I was inspired by his words and I hope to finish the pots for my new friend within a month. The bowl in the photo is the one he saw on our table. It’s made of stoneware clay and has a glaze on it called yellow salt. The texture on the outside came from a serrated trim tool I used when the clay was leather hard. I’ll be sure to post photos of his pots and link to it here once they’re up. 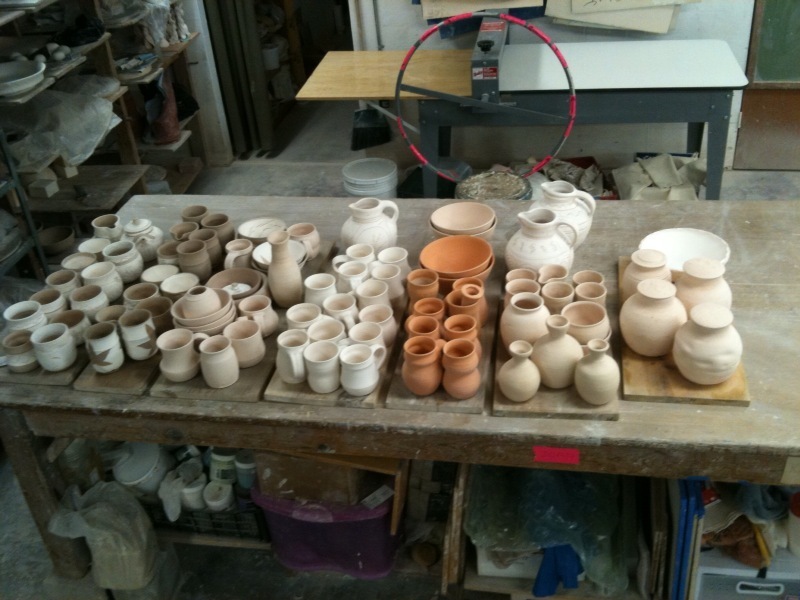 Here is a table full of pots ready for the next step. This photo was taken back in November and I’ve since glazed and fired them in the gas kiln at The Potter’s Studio in Berkeley, CA. I’ll post photos of the finished pots soon. It’s been so long since I have posted anything I just had to put something here in the new year. I recommit to posting once per week and letting go of the need for it to be perfect. It is a daily practice after all and the point is to post often to show my progress and the results of my practicing. Thanks for reading, and thanks to my family for their continued support. Richard Bresnahan. O.k. wow. 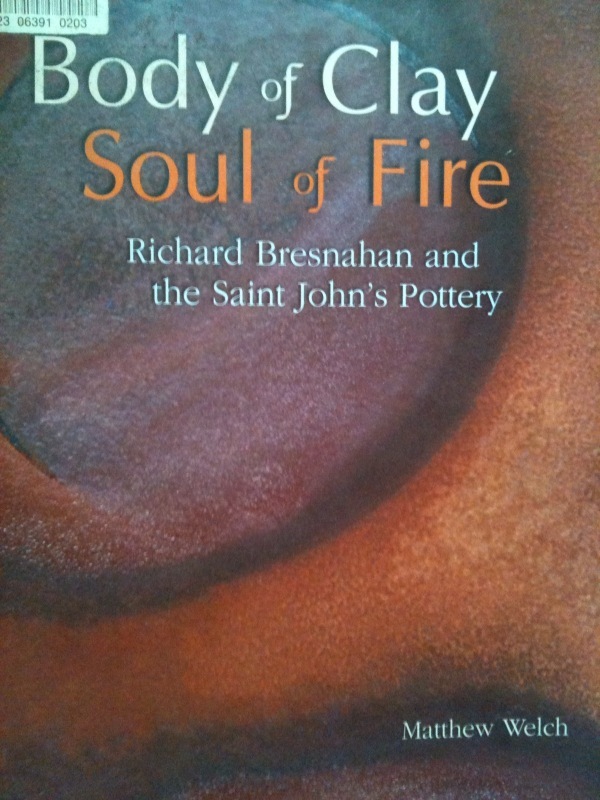 I had never heard of him until I stumbled upon a book in the SF library about him and his life as a potter. When I picked up the book I briefly scanned the photos of pots as I usually do to decide if it was something I wanted to bother with and saw tons of amazing pots that appeared to be wood fired. I left immediately with an armload of books including this one called Body of Clay Soul of Fire by Matthew Welch. In the 70’s, Richard Bresnahan apprenticed with Nakazato Takashi in Japan on the island of Kyushu. There he learned to make pots on a Karatsu-style kick wheel, build kilns and fire them, and how to use local materials. He now has a pottery at St John’s University in Collegeville, Minnesota where he fires a huge wood kiln. He uses local clay and local materials for his glazes and has found ways to take what others are throwing away and turn it into something beautiful. This book touched a chord with me and my desire to study with a master potter, fire with wood, and use ash glazes is even stronger now. Just looking at the photos of all these pots is inspiring. Reading the book is even more so. There is a video I found as well. The Richard Bresnahan story is full of lessons for life. He boldly went after what he wanted and the community of friends, teachers, neighbors, and family all supported him. His passion is undeniable and people come from all over the place when it’s time to fire that big kiln. Read this book and be inspired. I’m reading it now for the 3rd time. 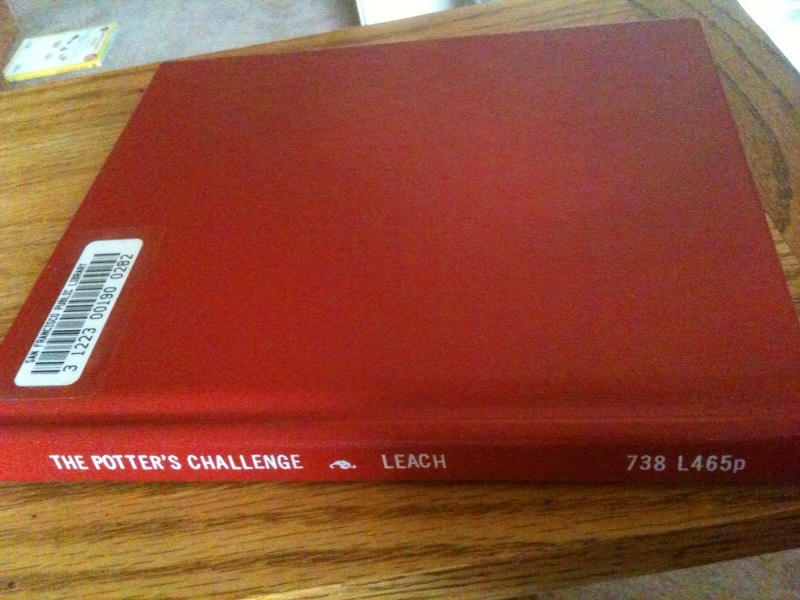 I’m very inspired by Douglas Fitch at the moment and what appears to be a country potter lifestyle. All I am going by are his videos. 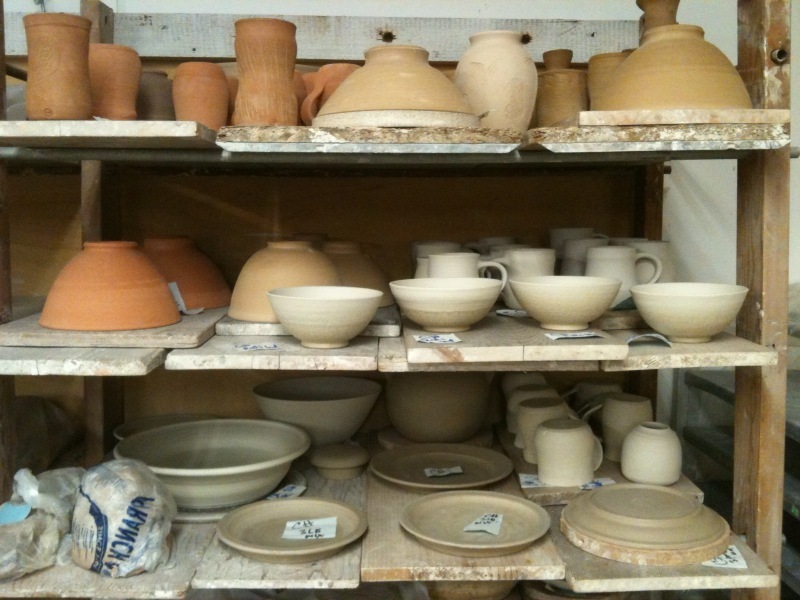 After reading Pioneer Pottery and Pioneer Potter by Michael Cardew a couple years ago I knew it was the life I wanted. I had to begin from there. I learned how to throw and glaze and reclaim clay and a whole lot more. Here I am now and have just watched all the videos Douglas Fitch made of his work and life there in Devon. There are sheep running around and ducks at his feet and birds chirping, pots being thrown and covered with slip, and other glimpses of life. It all looks like a great way to live a life. Ajira was living in Sidmouth when we met, but we did not venture out too much in Devon when I went to visit. Pottery was not up on my radar at that time. I was too busy being in love. We spent a little time at the Royal York Hotel in Sidmouth, went to Wales, London, etc. then we were on a plane to Cape Town, SA so I could meet her family before we got married in 2004. I would love to go back to Devon or Wales now to apprentice or study making pottery with some of my favorite potters. I love the connection to earth and place Douglas talks about in Hollyford Harvest – a film by Alex McErlain, 2009. Digging your own clay, using slip, firing with wood, and practicing pottery tradition are all things I am interested in doing. Hopefully my pots will have good form with life in them and vitality. I tell myself it does not matter where I live, but maybe it does. Everything I surround myself has an influence on my feelings and thoughts and therefore filters into my centering and energy level. I often use the process of kneading my clay as a transitional cleanse away from the rest of my day and into the clay and this moment of making pots. The spiral action is meditative, physical, quiet, and warms up my arms and shoulders. I often do this with my eyes closed to increase my awareness and my sense of touch, and to discover what is happening with the clay. The weighing up of lumps is the start of what I am about to make. All this touching informs me of the moisture content and plasticity and awakens my sensitivity and I am ready to throw. So being somewhere else won’t change that, it will simply be a different moment of getting ready to throw. But maybe the rest of my life will be more nourishing for my pottery making, family, and soul. I find it almost unbearable sometimes to be stuck here in this place wanting something else as time flies by. I convince myself to appreciate what I have and go from that place of gratitude, but I want what I want. City life is no life for a country boy. I tried to be big city living in San Francisco. I tried to be tech and fast paced and hip with music production. I tried to be on the cutting edge but I found the constant attempt to keep up exhausting and not very authentic. So it was not for me. I want a peaceful quiet country side with a community of potters and teachers and friends and group firings and flowers, trees, hills, and green. I want to walk in the woods and play in the mud with my boy. I want to have animals as friends who visit and are not threatened by me as a human. I want to go surfing in the sunshine with no wetsuit. And I want to make thousands of pots and find my voice as a country potter. I want to get on with it and yet I know that learning from a master potter will in the long run get me there on more solid ground. For now I am practicing and learning as much as I can. A country pottery is challenging in the burbs. Where do I build my wood kiln? Fire code? Too close to the house? 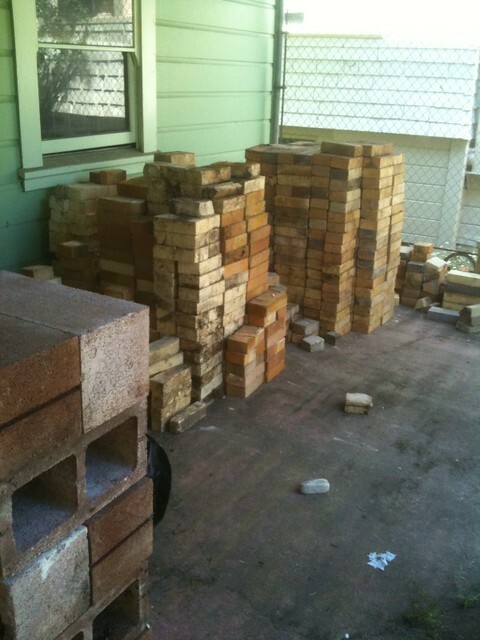 I even have free bricks enough to do it but not the space. So what? I will find a way. There is no stopping me now. Too many things have come together on my path for me to turn away. I am certainly not complaining. I am totally grateful for all the gifts and support. It supports the theory that if you boldly go for it, the universe steps in and provides. I have clay, glazes, bricks, wheels, tools, bins and buckets, burners, curiosity, a desire to learn more and more, a blog, a facebook page for Cameron Sharp Pottery, a library card, and the internet. I’m healthy and strong. I have support of friends and family, the praise of people who have seen my pots, a friend who is tight with a gallery, the ability to make pots, and the patience to go through the experience of learning by doing, the awareness to know when to let one go and make another. I have so much going for me already. I simply have to continue to be inspired and make more pots. I will trust the process of going through and not worry about what is on the other side. I got about a thousand bricks from a man named Caruso. He said I could have them if I took apart the kiln, swept up, and hauled them away. He said the kiln I dismantled was used by his friend Evelyn Kramer. It was a natural gas kiln made of hard and soft fire bricks with some ceramic fiber here and there. It sat on top of a layer of concrete blocks which he also gave me. It took me 3 trips to load and transport them in my van from San Francisco to San Pablo, CA. He also gave me some pyrometric cones, an 80 mesh sieve and three giant wisks for mixing up glazes. On the walls of the garage we went through to get to the backyard and kiln, were old photographs and faded pages torn out of of books and tacked up. Images of pots by Shoji Hamada, Bernard Leach, Michael Cardew, and others covered all the walls. There were posters and flyers of The Potter’s Studio in Berkeley, CA as well as a card from the Richmond Art Center. These were all from the seventies. I feel honored to be taking these bricks on to the future and saving them from the dump. Caruso said that if I had come one day later they would have been gone, hauled away by the city. So thank you Caruso for the bricks and all the extras, and for being so patient and willing to make arrangements for several trips out there to get them. Life is a mystery. Just when you think it’s going one way, things happen and suddenly the path opens up and the weather clears and the sunshine beams down and warms the possibilities. The past with it’s anchors and baggage and house full of grief needs to be lit on fire and burned down to the ground to make way for all the new life that is just there on the path waiting to be lived. Taking a few steps on this good path feels so right, so correct, so in-line with my soul and my true self. A happy potter. The simple pleasure of the sun warming my face is as good as it gets. Everything can have that quality of life if I let it. So a big thanks to Douglas Fitch for all the inspiration and the videos you post. When I get to Devon I’ll look you up. 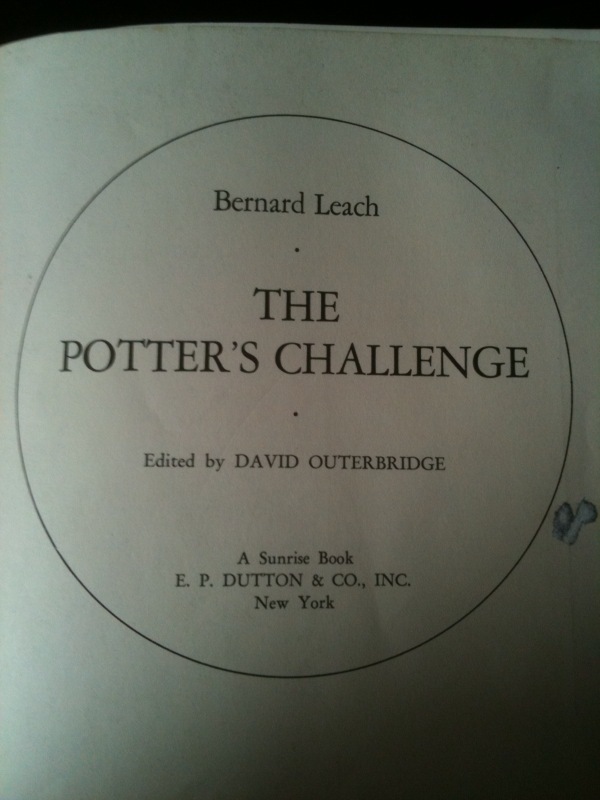 Just started an awesome book called, The Potter’s Challenge by Bernard Leach published back in 1975. Only up to page 30 and already completely inspired and fully believe I am on the right path. What he is saying rings so true for me. This is the tradition I am drawn to and moved by when it comes to making pots and why and how to make them. Last night at the SF main library I wanted to bring home a stack of 20 pottery books but had to reduce the pile. In so doing I would grab a book and flip the pages rapidly while scanning for something magical, a photo of a great pot. No names could be seen so my mind was free to judge the pot for itself without any association to a maker or the maker’s reputation. I had no criteria I was looking for, no color in mind or particular shape or type. What kept happening was amazing and affirming to me. I flipped through one book that had hundreds of pages of pots that did nothing for me until wow… what was that? I looked at the pot’s form and surface and color and it touched me deeply as good, true, honest, real, full of life, well made, timeless all in that split second glance. I found and read the small caption and it said Bernard Leach, Globular Pot, 1927. With the next book the same thing happened, quickly flipping until something grabbed my attention, but this time it was a plate, Michael Cardew, Bird Dish, 1932. He was a student of Bernard Leach. I loved his book The Pioneer Potter. More on that some other time but I also like pots made by his students like Svend Bayer and Mark Hewitt. The next was a tall bottle with gorgeous colors. Turns out it was made by Shoji Hamada, bottle, 1929. Again I saw the pot first and the name later. A few pages over and I saw another amazing pot, a bowl, 1923, same maker. Then this beautiful green flash went by as the speeding pages closed too fast. Wait! back up, what was that? It’s faceted, it’s stoneware, looks like Celedon. It’s a bowl by Katherine Pleydell-Bouverie, 1936. Also a student of Bernard Leach. In another book full of not much I flipped until one pot grabbed me. I let out a gasp as if I had found treasure. I knew right away who made this. It had to be Warren MacKenzie. I had seen a YouTube video of Warren MacKenzie throwing a bowl like it but could not have imagined how gorgeous and quiet it could have become after firing. It was a wide footed drop lip bowl with Shino glaze with iron brush work. He was a student of Bernard Leach. After flipping through 15 books about pottery without exception, all of the pots I was drawn to were made by potters cut from the same cloth so to speak. All in the same overall tradition, all different and yet all good form, great surfaces and colors and all with something that touched me in some way. All pointing back directly to Bernard Leach and his students, as well as Shoji Hamada, and maybe even the meeting of east and west. These are the kind of teachers I want to learn from and these are the kinds of pots I want to make. 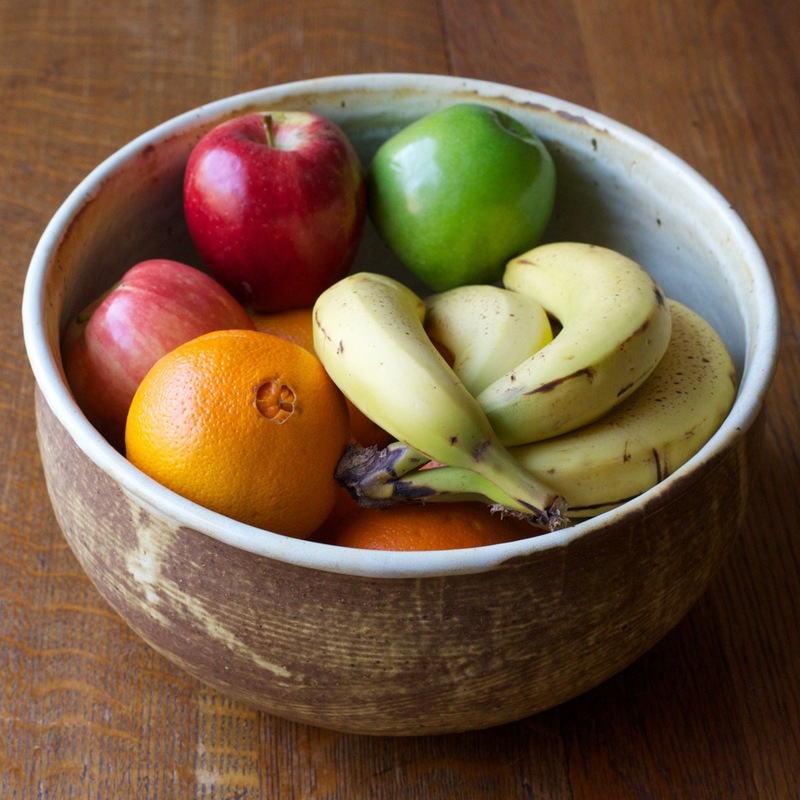 I am very much drawn to wood fired pots as well. Salt, soda, ash, shino, shells, and the stories told on the pots by the effects of flame are areas I want to explore under the guidance of a master potter. I love that wood fired pots look different from every angle and each side has it’s own personality and reveal themselves slowly. To study or apprentice with a master potter who makes pots from their heart in this way, would be a dream come true and a once in a lifetime opportunity. For now I will learn by practice and repetition. I trust that my experience flipping through the pages of these books skipping the pots that left me cold and landing on the ones that moved me, confirmed that I know what I like and what moves me and what does not. The instinct for what makes a pot good is in me already. I know it by feel and intuition not by study or by book. I know it in my heart. So now from my heart to my hands and into the clay I aim to make quiet powerful pots full of life. ok. now back to my book to see what else Mr. Bernard Leach has to say. Please comment if you have something to add to the conversation. Thanks for reading my blog. If you like it – like it.